Hey, friendly-friends! Things have been a tad hectic over on the back-end of these rosy parts… I just moved back to college this week and my neighborhood flooded today… Yeah. And I’ve also been creating content like crazy for almost three weeks now. I’m talking filming three videos a day! I’ve been working extra hard on video content to get my YouTube channel up and running before this semester starts, and I’m almost to 100 subscribers, woo (check out my channel here if you haven’t yet)! With how hard I’ve been filmingfilmingfilming, I’ve gotten way ahead of myself in videos compared to blog posts! Today is actually the official 2-year mark of my very first blog post! I’ve been posting about this anniversary for all of August, because I had so many fun things planned! This will be my final 2-year-celebration post, and this will be a combo of my ‘7 Lessons from 2 Years of Blogging’ AND my first Q&K! I started writing the ‘Lessons’ post when I posted the video but didn’t quite get to the point of hitting ‘publish’…. it happens! So I figured I’d hit ya with a twofer today! I’d love if you watched the videos and subscribed to my channel as well! 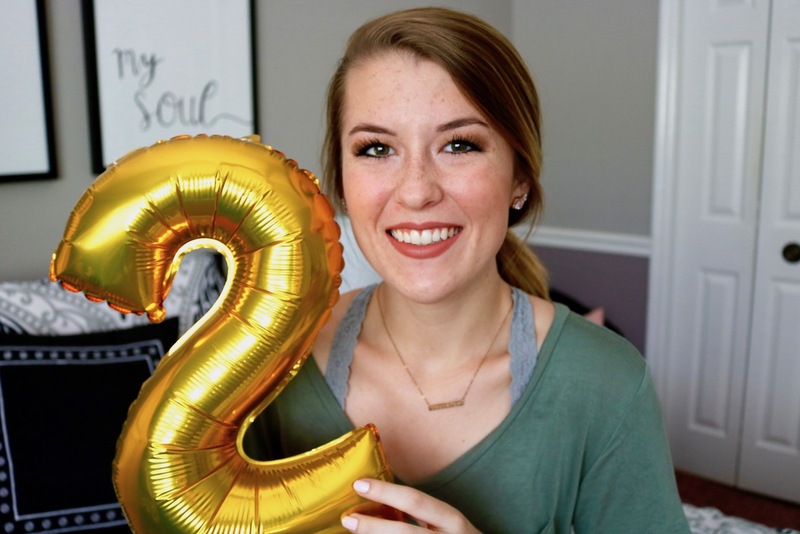 7 LESSONS FROM 2 YEARS BLOGGING – WATCH OR READ! Don’t let the numbers bother you. This has been a huge priority of mine since launching my blog. It’s a total mental perspective: you’re either focusing on the numbers or you’re not. I’d rather not! For my mental sake and for the sake of continuing to create just because I love to, I don’t let myself get down about worrying about my stats or the number of ‘followers’ I have, and I strongly advise bloggers, especially if you’re starting out, to do the same. Someone else will always be doing more than you, but someone will always be doing less. Don’t worry about the flowers next to you, just bloom. This is other people’s passions, too! Consistency! Advantage of posting regularly and having blogging as a part of your routine, compared to being a chore. Posting more frequently so expectation for each post is not as high. You never really know how your writing impacts others. People aren’t always going to comment. I’m not going to rely on people commenting to tell me if they enjoyed something. There’s many people who may never comment when they do like something (let’s be real, we’ve all done that! I do it too), so just because the comments aren’t flooding in, that doesn’t mean people aren’t impacted by what you post. If I stopped blogging after any post that never got a single comment, I most definitely would not be here writing this. People just won’t get it. This is something I’ve faced since starting my YouTube channel four years ago, and it was for this reason that I also stopped my channel back then. I’ve learned to accept the fact that other people won’t ‘get’ my blog, and that’s perfectly fine. I don’t write to please every person on the Internet, and I don’t have to feel worse about what I do just because someone doesn’t understand why I love what I do. I am my own worst critic. I’ve written about this before, but I’m way too hard on myself. My self-motivation and determination is what keeps me focused and always reaching for the-next-thing, but setting too many goals, or not rewarding myself/cherishing the goals I meet is a dangerous habit. Whatever it is, just go for it. Whatever that tug is on your heart. Whatever that great-big-goal is that you know you’re destined for. The best day to start is today. With my blog, blog Instagram, and YouTube channel, my only regrets are that I didn’t start them earlier! Growth for anything, be it a blog, new skill, or small business, is a slow slooooow process. I know my Etsy, blog, and YouTube were all things I just felt like I had to do. If you’ve got something like that to, just go for it, girlfriend. Thanks again for those who submitted Q’s over on my Instagram for my first Q&A! I hope this helps give ya a little insight into how I grew my blog over these two lovely years! I just sent out my first email newsletter last week, so be sure to sign up below so you catch the next one! This was so helpful. I started a blog about 8 months ago and don’t really get that many people visiting and have just put off as something that I’d do when I felt like it but it gave me so much inspiration and encouragement to keep on doing and God will show His glory in so many unimaginable ways. Thank you!